Savanna pines (Pinus elliottii var. densa) in Everglades National Park, Fla. Savanna trees such as these pines may help facilitate frequent fires in order to prevent other trees from displacing savanna trees and shifting the community from an open savanna to a closed forest. Photo credit: Brian Beckage. Fire is often thought of as something that trees should be protected from, but a new study suggests that some trees may themselves contribute to the likelihood of wildfires in order to promote their own abundance at the expense of their competitors. The research proposes a scenario for the development of savannas in landscapes that would otherwise become closed forests. 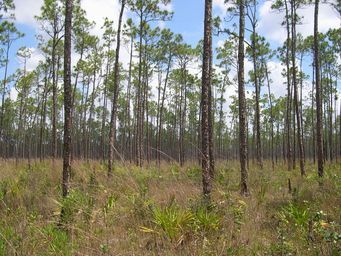 Examples of savanna trees that facilitate frequent low-intensity fires include the longleaf pine and the south Florida slash pine, both of which frequently shed their needles, providing fodder for wildfires. The savanna tree initially invades grassland, but by facilitating frequent fires, it limits its own density and thus prevents conversion to a forest. The National Institute for Mathematical and Biological Synthesis (NIMBioS) brings together researchers from around the world to collaborate across disciplinary boundaries to investigate solutions to basic and applied problems in the life sciences. NIMBioS is supported by the National Science Foundation, the U.S. Department of Homeland Security and the U.S. Department of Agriculture with additional support from The University of Tennessee, Knoxville.